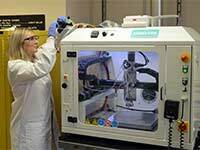 Chemical engineering student Emily Lynch adjusts a piece of equipment in the advanced energy materials lab in the Engineering Building. The Department of Chemical Engineering at the University of Wyoming has seen its fair share of accomplishments and recognition in recent weeks, thanks to the hard work and skill of its students and instructors. Chemical engineering student Delaney Dent was recognized for her efforts on behalf of a recognized student organization (RSO) on the UW campus. The organizations and associated individuals were recently recognized at the 16th annual RSO Awards of Excellence banquet. The 250-plus campus organizations provide outlets for students to become involved, make friends and network. They host hundreds of events on and off campus; attend conferences that enhance their professional development; and participate in service activities that impact the university and local community. Dent was named an RSO Officer of the Year for her efforts in forming the Phi Sigma Rho chapter, which is a social sorority for women in engineering and engineering technology. The department recently awarded the David O. Cooney Outstanding Teaching Award to Associate Professor Joe Holles. His specialization areas include heterogeneous catalysis, materials characterization and renewable fuels. Holles also was named a “Top Prof” by UW Mortar Board recently, and in fall 2017 was nominated for Eni Award, which provides a benchmark for innovative research into energy in all its forms. Eni is considered one of the global super-players in the oil and gas sector. David Cooney joined the UW Chemical Engineering Department in 1981. In 1993, he was named the UW College of Engineering Outstanding Graduate Teaching and Research Award recipient, and in 1997, he received the Outstanding Undergraduate Teaching Award. Cooney served as head of the Chemical Engineering Department from 1983-1990. Junior chemical engineering student Michael Downey has been hitting the books and excelling on the track. He was second in the 1,500-meter run at the UW 7220 Invite, and currently is ranked fifth in the Mountain West Conference in the event. His performance throughout the season has qualified him for the NCAA West Regional meet. Emily Lynch, a junior chemical engineering student, was second in a regional conference poster competition. Her presentation detailed catalyst preparation for carbon nanotube growth at the AIChE (American Institute of Chemical Engineers) regional conference. The event brings students from North Dakota, South Dakota, Wyoming, Colorado, Utah, Arizona, and New Mexico to meet and network with other chapters. At the conference, there are four competitions in which students can compete, including Chem-E Jeopardy, Chem-E Car, paper presentation and a poster presentation. Lynch was the runner up in the poster competition and hopes to present her work in the fall at the National AIChE Conference in Pittsburgh, Pa. The UW team of Sarah Kamphaus, Todd Muller, Kameron Jensen, and Alex Brown placed second in its group in Chem-E Jeopardy. Recently elected UW AIChE President Seth Harris also presented his paper at the competition.